This was my first year at the New York Comic Con. I went to the event expecting it to be similar to the New York Anime Festival last December. After all, it was in the same venue and it was being run by the same group of people. So I was in for a huge surprise when I discovered that this convention was actually over six times the size of the Anime Fest. It was pretty overwhelming. The dealer’s room was massive and crowded. I only bought two books and then had to get the hell out of there. I didn’t find much solace in the panel section either, as a triple shot of Avatar, Venture Bros, and Robot Chicken panels turned the hall into a madhouse. But I did get to see some awesome events, like a live performance from geek superstar Jonathan Coulton (followed by his autograph) and the fantastic TM Revolution concert at the end of the day. Even if TMR does look like a girl, the bright lights, heavy guitars, and bouncing electronica made for a great show. 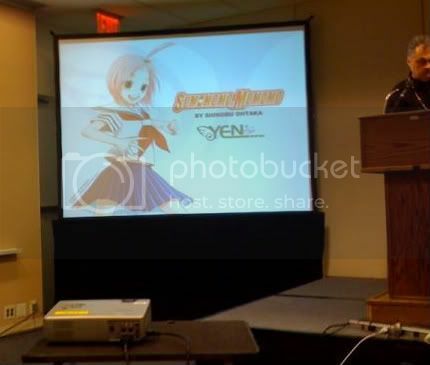 But as an anime fan, what was the biggest shocker for me on Saturday was the panel from newcomer manga publisher Yen Press. While the anime industry is pretty easy to keep tabs on, the manga industry has grown so big and flexible over the years that I just cannot keep up with all the changing. Because of this, my mind breaks the manga industry into only four categories: Tokyopop, Del Rey, VIZ, and none of the above. I cannot tell you the difference between a Seven Seas release and a Comics One title, only that they are not done by any of the big three. My first clue on why this company was awesome was the fact that they were the ones that had put out the series With the Light: Raising an Autistic Child. This series is a masterpiece of the medium and is simply the best comic I have read in years. I will be posting a gushing review of it after I get through the newly release second volume, but do yourself a favor and check out the first volume right now. So With the Light and now Haruhi… well, they got good taste in properties. But then they come to the topic of Yen Plus, a new monthly magazine that will feature Japanese, Korean, and American titles. Hold on, did they just say a new monthly manga magazine? Since the manga boom of the early 2000′s, there have only been three Japanese-style manga magazine published in America – Shonen Jump, Shojo Beat, and Raijin Comics. Jump and Raijin both came out back when I was in high school, and I quickly found myself subscribed to both magazines. While Jump was decent, it focused completely on the action adventure genre with an unhealthy obsession over Yu Gi Oh! I was clearly not the audience they were going for. Raijin, one the other hand, was amazing. It featured all kinds of genres like extreme violence, stupid harem comedies, intense politics, and my favorite, cute talking animals. Raijin was also bold enough to come out in a weekly format, as apposed to Jump’s monthly release. It the ultimate experience for the mature American otaku, but it just failed to capture enough of the market at the time. The publication folded and was out of production within a year. It’s been over 4 years since I received the last issue of Raijin, but I was reminiscing about the publication on the way to the convention that Saturday. I had given up on Jump years ago, and have been periodically reading Japanese magazines like Young Animal, Shounen Ace, and Champion Red Ichigo. But as you can imagine, reading Japanese is pretty difficult and I wished that there was still an English language magazine that was aimed at my demographic. VIZ even further salted the wound by hyping up Slam Dunk at their panel, which used to be one of the series in Raijin, but never lived to see an ending to its first story arc. Then comes Yen Press to finally answer my wishes. Yen Plus will begin publication in July, and it will finally bring back a Jump alternative to the older manga audience after four long years of waiting. What makes Yen Plus so awesome is that it will be receiving all of its Japanese material from Square Enix, one of the biggest supplier of otaku-desired manga properties. And as they went through the list of the intended content for the magazine, the audience (and the entire Otakusphere) let out gasps of amazement. Soul Eater, Nabari no On, Higurashi, Bamboo Blade, and my personal favorite, Sumomomo Momomo. This magazine is going to have a great selection! I think another good sign about this publication is that Yen Plus will also feature Korean and American comics, which will be printed left-to-right while the Japanese will remain right-to-left. While many fans might be discouraged by this addition, I completely welcome it. 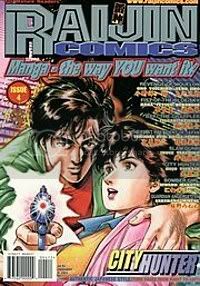 In my opinion, there is no cultural or artistic differences between Korean and Japanese comics, and American comics offer a unique experience to its domestic readership. Including this kind of content in a clearly Japanese-dominated manga market is pretty risky on the part of Yen Press, but then again, so is trying to put out a Japanese-style manga magazine in America. If it were not for these types of risks, we would never have a comic like With the Light available here in the US. Yen Press clearly has the balls to do it, and I commend them for it. 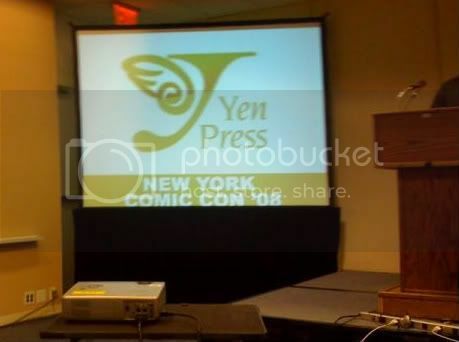 Yen Press was the clear winner of the New York Comic Con. On the one hand, they know how to cater to the otaku audience by going for the Haruhi license and partnering up with Square Enix for more geeky Japanese goodness. On the other hand, they’re not afraid to take very big risks by putting out phenomenal titles that are no where near the mainstream, or by attempting to put out a manga magazine even after others have failed in the past. Not only has this company broken out of the “not Tokyopop, Del Rey, or VIZ” category in my mind, they could potentially be the next best thing in the American manga industry. I look forward to hearing more from this publisher, and I will be the first to buy a subscription to Yen Plus when it becomes available. Good show, Yen Press. Good show. This entry was posted on Wednesday, April 23rd, 2008 at 6:15 pm by Scott	. « What’s Happening to the Anime News Network?